FREE SHIPPING ON ALL SIZES. Duplicate the most intricate parts. 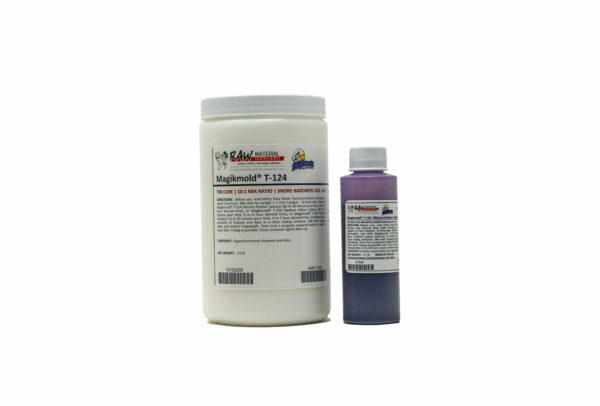 Magikmold® T-124 Tin-Cured Silicone Rubber will reproduce the finest detail and is one of our top sellers! Magikmold® T-124 is a high strength, pourable, two-component room-temperature curing (RTV) silicone rubber. 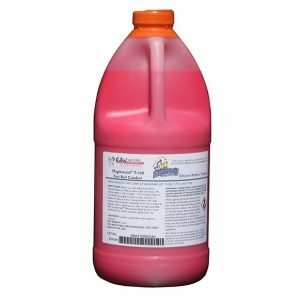 Low in viscosity and easy to pour, we recommend this for duplication of models high in detail and with many undercuts. Use the standard purple catalyst for about 60-90 minutes working time and a 12-18 hour demold time. For a faster cure, use the Medium-Fast Yellow Catalyst or Red Fast Catalyst for the fastest cure. 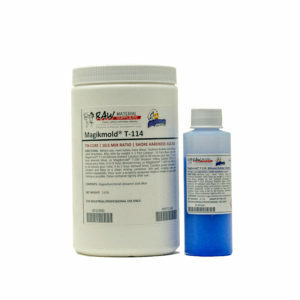 Magikmold® T-124 is a pourable material; however, you can make it brushable with the thixotropic additive. Pot Life 60 – 90 min. 30 – 35 min. 15 – 30 min. Demold Time (@ 77°F) 12 – 18 hr. 6 – 8 hr. 4 – 5 hr. Outstanding chemical resistance to attack by polyurethane resins. Mold life is significantly extended. 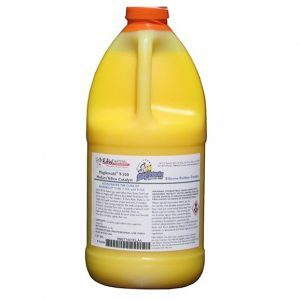 You may need our thickener fluid. Makes silicone paintable, so it doesn’t drip or run! Copyright 2019 Raw Material Suppliers. All rights reserved.